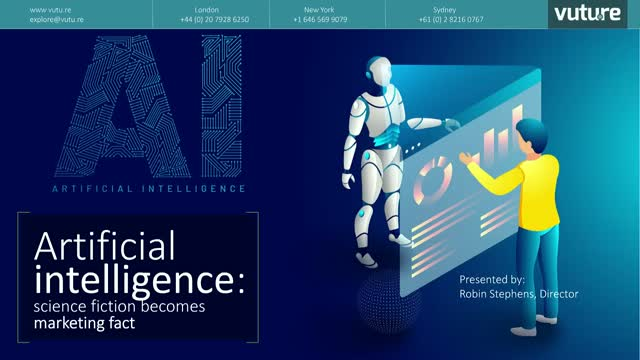 As the Bank of England weighs in on the impact artificial intelligence will have on employment and, in turn, the economy, understanding the reality of AI for business and how to prepare for its arrival has never been more important for you and your organisation. Join us for a webinar that will dispel the fiction and present the facts to showcase the value that AI can deliver to your firm. Digital disruption is a challenge for any business but one that many organisations must embrace. Learn who is driving these projects forward in 2019 and how culture changes can be as important as the technology deployed. Learn more about the millennial and iGen generations: discover the many advantages their skills can bring to your organisation; find out how your company can drive more effective growth by harnessing their potential; and understand why the time is now to put these groups front and centre of your business, for enhanced culture and stability. Join Vuture Director Robin Stephens for his webinar: Mind the gap: professional services and the need to embrace Generations Y and Z, as he dispels the myths and does the maths that will push the boundaries of your business in 2019. Learn about the trends that will impact your business growth in 2019 and plan effectively to achieve your goals. It's time to build your strategy and sign off on your budget for the coming year. However, with all the change occurring around us, this year might feel more daunting than other years, so we've put together a webinar to showcase the trends that we believe will influence your organisation's strategy to help you with that all-important planning. Join us on December 4th, 2018 at 4PM GMT to learn more about email marketing. From best practices to industry insights. Lili Boev, Director of Client success at Vuture will reveal her secrets. Increasingly, marketing must promote a business-led, customer-first attitude, through understanding client insights to drive relevant and timely engagement. Join us for a webinar to learn how automation technology can deliver bespoke experiences designed to increase measurable engagement and create rewarding, focussed conversations between your organisation and clients to drive positive ROI. Vuture was established to transform the communication and event model for professional services. The platform’s seamless integration with world-leading CRM providers enables users to create unique, consistent and personalised communications, securely, to power value-driven client experiences. Vuture’s automation technology puts its professional-services users in control to build trusted relationships, drive brand loyalty and, efficiently, deliver engaging, multichannel campaigns that place their clients at the heart of the business.